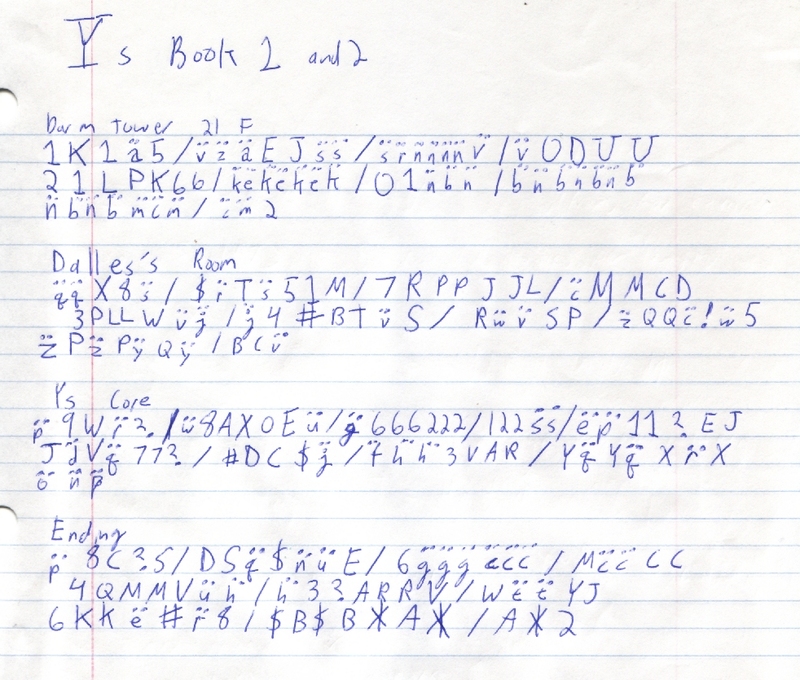 I didn't make any maps of Ys Book I and II (instead prefering to use the old fashioned "run around until you stumble out" technique for beating mazes), nor did I take any notes or record any clues for solving mysteries. But I did write down a few passwords. Ys Book I and II has an almost ideal method for saving game data. With the Turbo Duo, you can save right on the system itself, with no need for memory cards, or to write down long, cumbersome passwords. But an optional password system is there, if you ever run out of memory on the system, or want to preserve a file for sentimental reasons, or want to safe-guard against losing a save, or want to share a save with someone else, or for any number of other reasons. Frankly, I wish more games had this dual system. So, here are a few passwords I decided to take from my first play-through of the game. The umlauts were added by me as a way to more easily distinguish between capital and lower case letters. I got the idea from The Guardian Legend.